Even to a mother, the scream from her 4-year-old was more urgent and scary than anything she had heard before. Tangie Griffin jumped out of bed and went to the bedroom where her twin sons slept. Shaquill was there, but Shaquem wasn't. She frantically searched the house and found him in the kitchen. He had climbed to the silverware drawer and was threatening to cut his fingers off with a knife he held in his right hand. "All I could do was take the knife away," Tangie said. "He kept screaming that his hand hurt. I picked him up and rocked him back to sleep. And then I called the doctor." 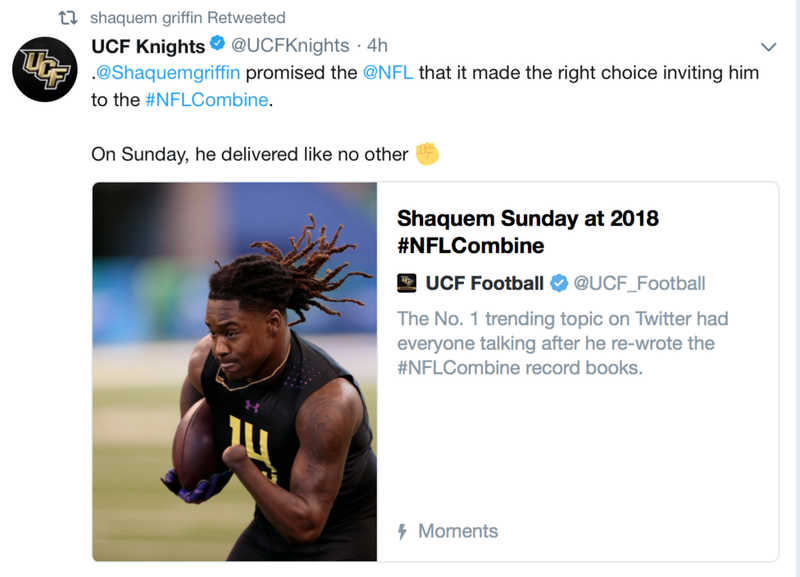 The next day, Shaquem Griffin's left hand was amputated. Shaq Griffin suffered from a rare birth defect. Doctor's discovered that a tiny amniotic membrane had wrapped around his hand while still in-vitro, prevent his hand and fingers from ever developing properly. As a result, he was born with fingers that were extremely painful and sensitive to pressure or touch. The day after the surgery, Shaquem was taken to day care. He and he and his teacher were given explicit instructions for him not to do anything outside or take part in any activities. "I go to pick him up and I find him outside with a football in his hand and his bandage just dripping blood," Tangie said. Shaquem has displayed this kind of determination his entire life. "I didn't care, I was going to play football regardless," he said. "It was tough until I had my fingers removed, but after that I knew I was going to play again. The pain was gone. … It didn't hurt when the ball hit." Shaq and his twin brother grew up on football. They shared a "both of us or none of us" mentality growing up, and as a result played for the same team all the way through college. Both are athletically-gifted, but as you might guess Shaq had to constantly battle through adversity. There were many instances where Shaq tested better and performed just as well as his teammates but would still find himself demoted to the bench or practice squad. It didn't matter though, he never quit and consistently battled his way back into the starting lineups. Shaq watched his twin-brother get drafted to the NFL's Seattle Seahawks last year. This year it was his turn. After being snubbed originally, Shaq later received at late invite to this year's NFL combine. Once again he was determined to prove all of his doubters wrong... and he did. Yesterday, Shaq set an NFL combine record for linebackers by posting a 4.38 time in the 40-yard dash - the fastest time ever. He also produced a respectable 20 reps in the bench press, and he did it with a prosthetic hand. He was also the most tweeted subject globally last night, surpassing the Oscars. As I watched the highlights this morning and reflected on the sheer determination displayed by Shaq Griffin, I couldn't help but think about how it could apply to our lives. Is there something that is holding you back? Are there people telling you that you aren't good enough or that you can't do something? And if there are, do you listen to them or do you push through it?